Andrea Sanderlin may be the real life Nancy Botwin, the maternal drug dealer on the Showtime series "Weeds," played by Mary-Louise Parker. The mother of two from tony Scarsdale, N.Y., is charged with running what the Drug Enforcement Administration calls "a sophisticated operation to grow and process marijuana" in a New York City warehouse. "Agents discovered two separate rooms constructed within the warehouse designed to grow marijuana," said DEA Special Agent David Lee. 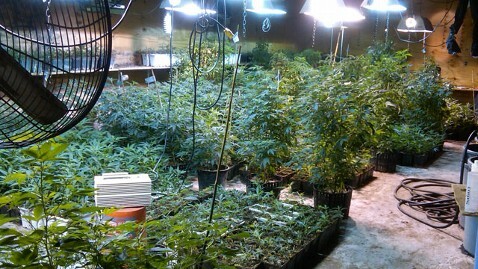 "Each room contained state of the art lighting, irrigation and ventilation systems to facilitate growing the marijuana." According to court records first reported by thesmokinggun.com, law enforcement agents from a DEA Strike Force seized more than 1,000 marijuana plants and large quantities of dried marijuana Sanderlin is now charged with intending to distribute. DEA Special Agent in Charge Brian R. Crowell said the warehouse hid a "highly sophisticated indoor marijuana grow operation." "The warehouse was filled with over $3 million worth of hydroponic marijuana and the organization covertly produced nearly 3,000 marijuana plants," Crowell said. Authorities said a search of Sanderlin's property uncovered books on laundering money and how to grow pot along with equestrian gear. She is an avid fan of riding horses, officials and her lawyer said. She also drives a 2010 Mercedes SUV. Sanderlin, 45, who was arrested on May 29, has pleaded not guilty to narcotics offenses that could get her 10 years in prison. For now she is being held in jail though a judge in Brooklyn left open the possibility of bail at a later date. Sanderlin's attorney Joel Winograd said, "We're putting together a bail package and hope to have her released at the end of this week or the beginning of next week." "Our primary objective is to get her released so she can be there for her two children. She has never been in trouble. She is a full time mother and she is an equestrian," the lawyer said. Winograd said the charges were "shocking to anyone who knows her." The investigation began in April when court records say a confidential witness told authorities a woman named "Andi" was growing marijuana in a building in Queens that houses a company known as Fantastic Enterprises. Suspicions were bolstered when the local utility told authorities Fantastic Enterprises "was using an unusually high amount of electricity."